There is a short but entertaining story to this, which deals with a range of matters from lack of respect for quality to wanting to kill people from a distance to destroying irreplaceable artefacts to dealing with insurance companies to fixing the unfixable to boldly going where……you get the idea. This little story, although sort of entertaining, was definitely not so for Marc; who shall otherwise remain anonymous. He sold his lovely old (mid sixties) Vox AC30TB to a bloke in Spain who desperately wanted to buy it. My own involvement up to that time was that I had rebuilt the output stage for him a couple of years earlier. Although you could have bought one of these new in 1965-ish for a hundred and twenty quid or so, you certainly can’t now. So, the deal was done and the lovely Vox sailed away to Spain having been packed and cased by Marc, who is the soul of conscientiousness. So it would have been very securely shipped. After a week or so, the Spanish bloke decided that he wasn’t actually as keen on buying as he had been, and took this up with Paypal. He had a full refund, and sent the amp back. All this, although a sad indictment on honourable dealings seems (to the modern mind, at least) alright. But it didn’t stop there. The lovely Vox AC30TB came back in the in same box without any packing. I did mention ‘lack of respect for quality’ did I? It was, unsurprisingly, very much the worse for its journey, with the front baffle and casework badly damaged. It also appeared to have had less than expert hands inside it, than it deserved. It’s about here where I get involved again. Marc needed an estimate for repair for Paypal as he was making a claim for damage in transit. The big problem with an estimate in this situation (i.e. major accidental damage) is that you need to do all the repairs to find out what it will cost. There is so much in an amp that might look (and test) alright, that actually isn’t. Not reliably so, anyway. The valves would all need to go, for a start, whether or not they tested ok. The result of this was that the amp was a write-off, mainly because the speakers (original Vox Blues) were damaged, and therefore it would not have been possible to bring the amp up to original spec. What a shame. These amps should be treated with kid gloves, not hobnail boots. 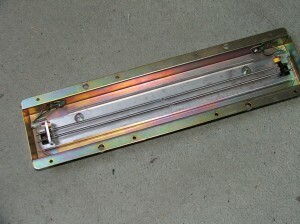 The Accutronics spring reverb has been around for a long time. They haven’t changed much, except that there are more options for the transducer specs. The idea of this little missive is to get to find out when they might be repairable. The answer to that is ‘Quite often’, and for no more money than a blob of solder. But let’s clear up what a ‘transducer’ is, for a start. The yellow thing is a transducer. A transducer can be many things, but basically, it’s any electronic wozzit that converts one form of energy into another. In this case, this wozzit converts movement into electrical voltage/current. Or the opposite way round, i.e. electrical current/voltage into movement. This means that the speaker in your amp is a transducer, as is any form of microphone. The Accutronics has two transducers, one at one end of the springs we can see in the top pic, and another (looks the same but isn’t) at the other. One is the input transducer, the amp puts out a voltage /current to this, which creates a magnetic field in a dooflicky called ‘the armature’ and this acts on two very small magnets connected to the springs. This effectively creates movement in the springline which is an analogue of the electrical impulses applied to the transducer coil. That’s basically what the transducer is; a coil. 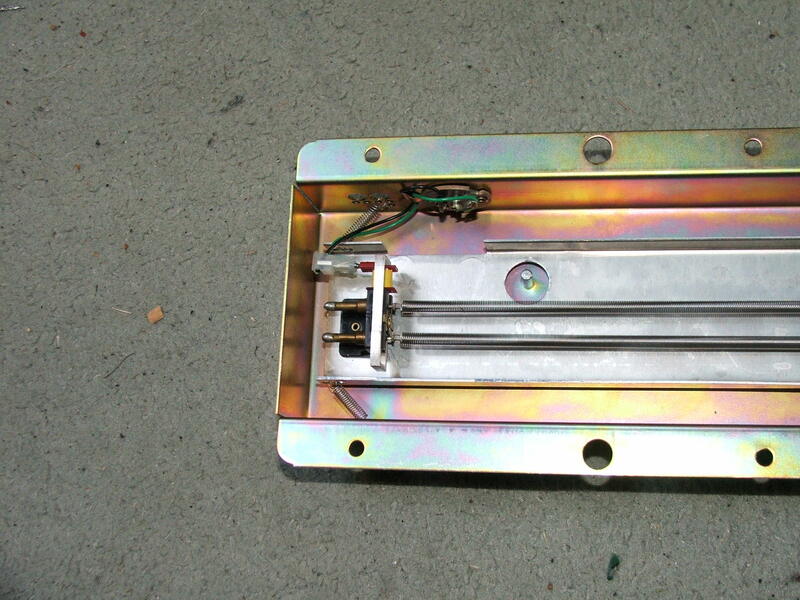 The coil at the other end (the output transducer) of the spring picks up the movement of the spring, converts it to electrical signals, and the amp’s circuitry amplifies these small signals and mixes it with the straight sound through the amp. So the amp circuitry for the input side of the reverb is completely different to that of the output. Depending on how old (or expensive) the amp is, the drive to the input might be a chip (op-amp, and cheap), or a transistor (still cheap,) or a complementary pair of transistors (not so cheap) or a valve driving a transformer (definitely not cheap. Most early Fenders had this arrangement and the later ‘reissues etc.’ not.) It makes a big difference to the quality of the sound through the Accutronics device. From the above we can see that, if you plug the unit into your amp the wrong way round, you are up for a disappointment, because it won’t work. The two transducers have completely different specs; the input being quite low impedance and the output very much higher. If you’re going to swap a unit in an amp, you should look on the Accutronics/Belton website, because there are a lot of variations of these things these days, whereas the early models were a spring line unit that worked, and nobody bothered too much about the numbers. Anyway, there is a code printed on these units , and you need to compare this to the various specs on their website. Not difficult, just irritating. Or maybe that’s me. Damn! I was going to do this blog without any niggly quips etc. So what might you be able to repair in one of these? The first thing to check with a multimeter set on a low ohms scale, is the readings on the phono connectors. The input should read a few tens of ohms and the output, a couple of hundred or so. If these read ok, you’re looking for a fault in the amp reverb circuitry. A check on this is easy. Turn the reverb up and put your finger on the plug of the output lead. It should buzz. If not, problems. Not easy to test whether you have a drive to the input. Grounding on the unit comes in a variety of forms. 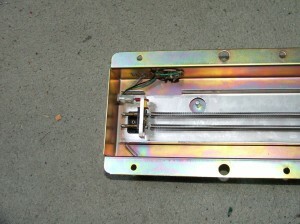 The old ones used to be grounded through the frame of the unit via the rivets that held the phono sockets in. Corrosion often messed the ground integrity up. A ground wire between the two phonos will usually sort that out. Have a good look at the wire from the phonos on the unit to the transducers. They often break because of the constant vibration of the spring unit. 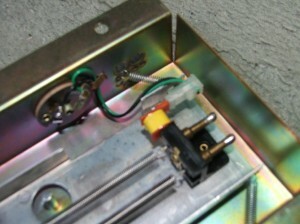 A break at the phono end is repairable (easy); a break at the transducer end is usually not. Much of this can be sorted out with the unit out of the amp case. A cup of tea. And a macaroon!